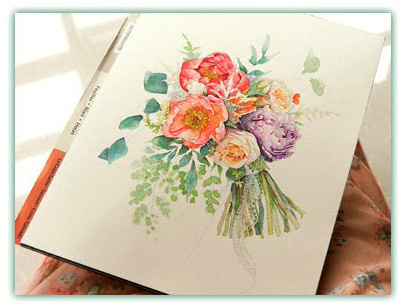 Bride Bouquets - by Watercolor Painting ~ DIY Tutorial Ideas! 01. 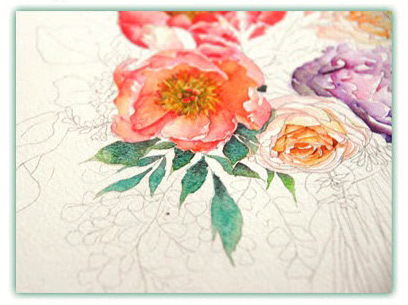 Color the flowers after the sketch lines are completed. I prefer to start from the central one. In case the sun light comes from the top right we'd better paint the ground color by light yellow along the inner side of the petals. Darken the shaded area on top right while remain highlights at the bottom left. 02. 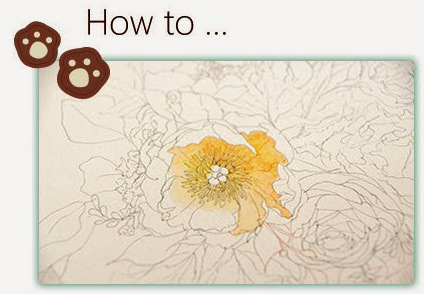 Draw the bud by light yellow and khaki after the ground color is dry, and then add permanent rose red on tips. 03. 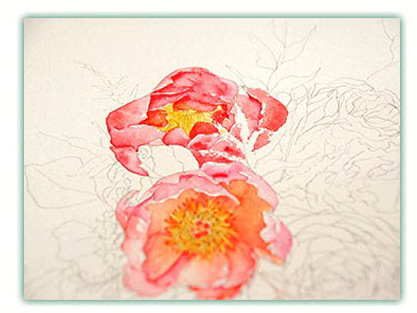 Use the permanent rose red as the primary color. 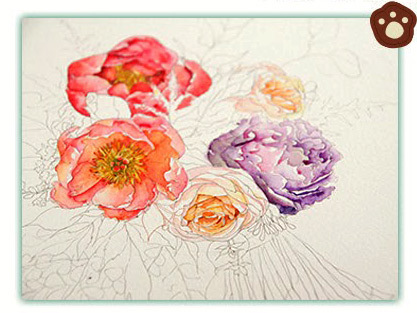 I choose two No.8 paintbrushes to color the petals piece by piece, one brush with water, the other with pigment. 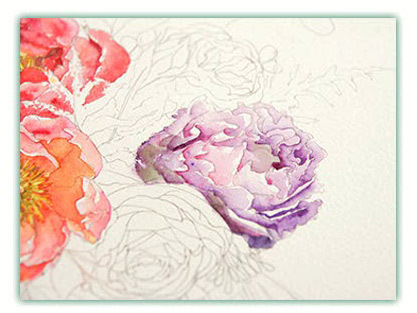 It's enjoyable to watch the blending process of water and pigment although it's time-consuming. Here's a tip for you. 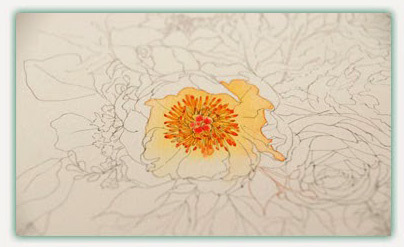 To avoid color blending, it's advisable to paint neighboring petals after you dry one petal by a hair drier. 04. 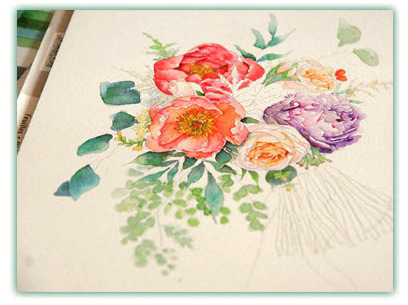 For the second flower, paint as the first one. Light yellow for the ground color of the bud while red for petals. Darken the interior of the center by Khaki after the watercolor is dry. 05. Purple and permanent rose red for the peony with a drop of sharp green at last. Deliberate highlight makes the whole picture feel more air-breathing. 06. 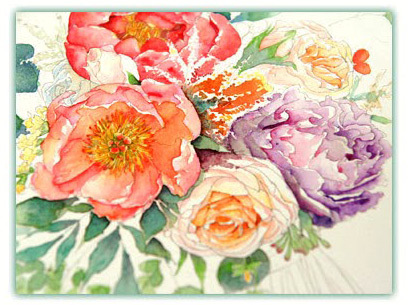 I use light yellow, orange and a little permanent rose red for the two roses, with ochre for the shade. Grey should be avoided to remain a high degree of saturation. 07. 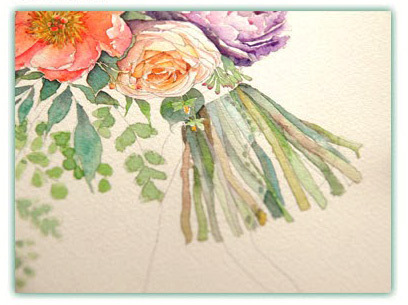 You can draw the leaves more casually with a range of conventional colors from jade green, shape green to ultramarine. Grey is needed at the stem of leaves to create drop shadows. 08. Slowly paint the other parts of the plant at will but with great patient, a little yellow here and some red there. 09. The space area in the center of the picture is the junction part of the flowers. Space means the dark shadow area. 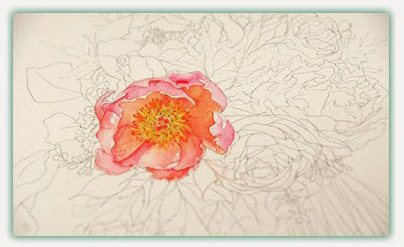 Grey going with orange, permanent rose red and other flower colors is perfect for such part. A reasonable degree of saturation is critical to prevent the whole picture from a dirty look by deep grey or dark colors. 10. Colors for the stem include sharp green, jade green, ultramarine, purple, light yellow, khaki and ochre. The best way to present a semitran spa rent effect of the lace is to lighten colors by more water. 11. 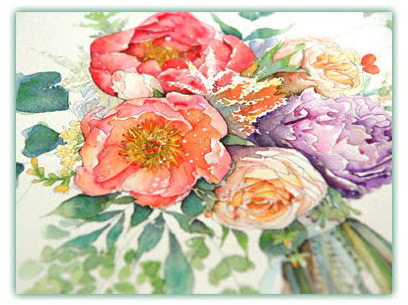 Darken the shadow along the edge of the flowers by grey color to create an evident third dimension effect, then throw drops of water with white acrylic ink/paint. 12. 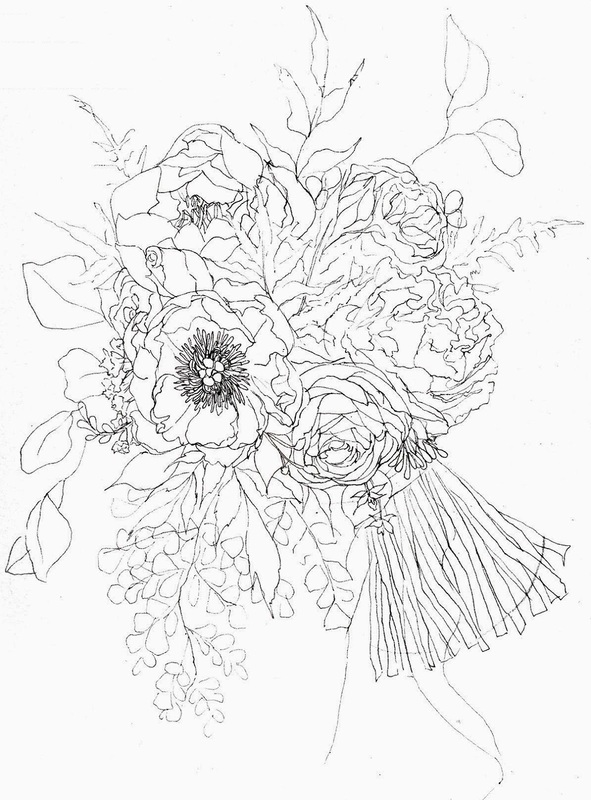 The completed bride bouquet i ideal for summer decoration.